The following videos are real time action videos from some of the stations 'shouts'. They present the nature of how stressful yet vital the actions of RNLI volunteers are. 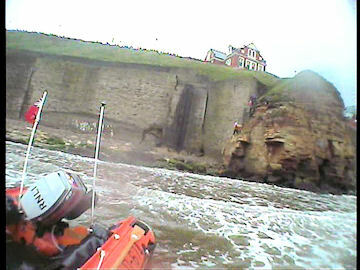 At 12.30hrs on Saturday 5th November 2011 Humber Coastguard requested the launch of Whitby’s ILB to assist two persons cut of by the tide to the west of Whitby Harbour below the Spa Pavilion. Whitby’s ILB launched at 12.36hrs and exited the harbour, and made there way to the scene to find two young people 10 meters up from the beach on cliffs directly under the Pavilion. After the ILB landed on the beach, one crew member made his way to the cliff and was able to climb up to the casualties and make contact. Due to the wet and slippery conditions the casualties were unable to move up or down the cliff. At this point a decision was made to take the casualties up using the Coastguard cliff team. Whitbys ILB remained on scene to reassure the young people until their evacuation was complete. Whitby’s ILB returned to Station at 14.54hrs. 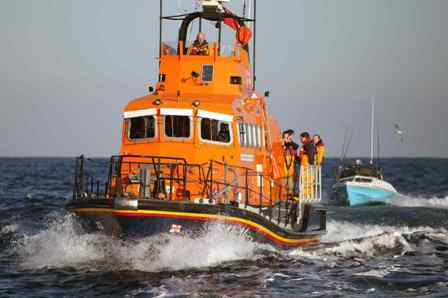 On Saturday 14th January 2012 at 11.45am Whitby's All Weather lifeboat "George and Mary Webb" received its first job of the year. They were tasked to assist The Daddy, a small pleasure boat located ten miles North East off Whitby. 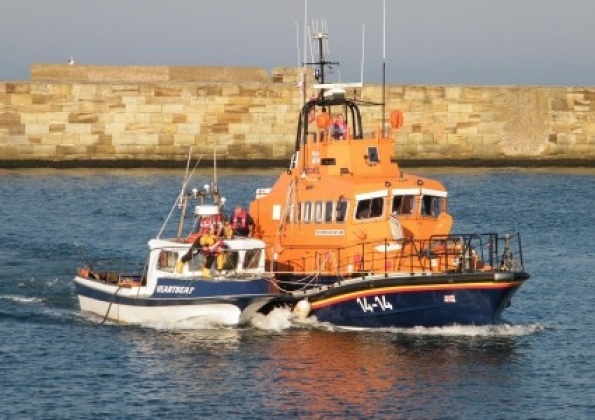 The RNLI lifeboat arrived on scene at 12.15pm along with Tynemouth RNLI lifeboat who attended the incident as they were performing engine trials in the area. Whitby lifeboat established a tow to the casualty vessel and proceeded to tow the vessel back to Whitby Harbour where they arrived at 2.15pm. The casualty vessel was then towed up the harbour by another boat. The lifeboat was refuelled and made ready for service once again at 2.30pm. On Friday 20th January 2012 RNLI Whitby lifeboat station was contacted by the Harbour Master to discuss the weather conditions at the harbour mouth. The harbour office were expecting a disabled trawler (The Noronya) under tow by another trawler "The Keila" who had been on passage from Stromness in the Orkney Islands for repairs at Whitby Parkol following mechanical failures on the Noronya. In October 2011 the charter angling vessel "Heartbeat" broadcast a "Mayday" after taking on water nine miles North of Whitby with 6 people on board and a dog. The all weather lifeboat was launched on service taking out put a salvage pump to be transferred to the floundering boat. 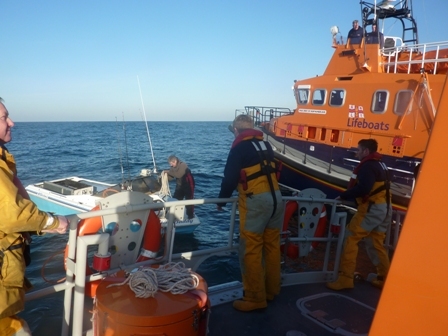 On scene the crew of the lifeboat took the fishermen and dog off the boat. With the increasing use of the helmet video camera I have added a second page of videos which can be accessed using the link below. There is no doubting that Whitby Lifeboat Station remains one of the busiest on the north east coast.